Trokie offers high grade medical quality products. Trokie’s products are designed to include the needs of sensitive patients with varying degrees of restrictions both medically and diet-wise. All Trokie’s products are sugar free, gluten free, have zero calories and are 100% vegan. With Trokie, it is an entirely different life – a life free of pain and fear! 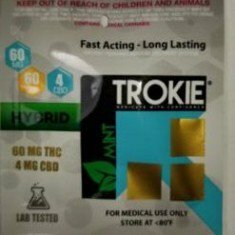 Trokie Edible Mint Drops Hybrid offer long lasting, fast acting healing with the cannabis compounds infused in it. That’s not the only beautiful thing about this medicated candy. It gives a minty fresh breath and well oiled mouth, with a really nice feeling of well being you can sense almost immediately. Place dose under your upper lip and try to limit the amount of sativa created to allow maximum absorption take place. The cannabinoids, terpenes, and flavonoids will cause some tingling in the throat when the medicine starts to work. Dose again after an hour. Peg, Organic Cannabis Extract, Organic Stevia, Organic Mentha Peperita Oil, Natural Flavor (Vanilla, Honey and Cream) Extracts, Natural Gum Arabic, Natural Citric Acid, Natural Magnasweet®, and Organic Orange Oil.